A mission to create a moment away from the madness. In the hustle & bustle of London, nothing satisfies quite like indulging in a fresh handmade doughnut, paired with a perfectly prepared cup of coffee. Great care goes into training our team of baristas, so not only are they a warm and welcoming face, they also know just how you like your coffee. We are proud to serve some of the highest-grade specialty coffee available, sourced and roasted by Caravan Coffee Roasters. A London-based roastery, Caravan Coffee Roasters trade directly with farmers from around the world to not only ensure quality, but to foster close relationships with producers and maintain a positive social and environmental impact. Their changing Market Blend is available at all Crosstown Doughnut & Coffee Bars, as well as a rotating, seasonal single origin at select locations. This changes frequently, so ask your barista for the latest offering. Sandows are the first British cold brew company, founded independently in London. Sandows Cold Brew coffee is a slowly brewed filter coffee, which offers a light, refreshing and super caffeinated alternative to your daily brew. Alongside their on-the-go flasks, we also serve their Nitro Cold Brew in select locations. Pulled through a tap and infused with nitrogen, this cold brew is super creamy and dairy-free – Perfect for the Summer months! Cold brew is coffee infused with cold water overnight. This is not hot coffee left out to go cold – it’s fresh coffee and filtered water, which is brewed slowly, without heat. The result is a much smoother flavour without that bitterness you usually get in black coffee. We serve quality milk alternatives at every Crosstown Doughnut & Coffee bar for the best dairy-free speciality hot and iced drinks. Minor Figures oat milk and Bonsoy soya milk are available at all locations, with Plenish organic coconut and cashew milks, as well as Califia Farms almond milk, on offer at Vegan Crosstown in Marylebone. 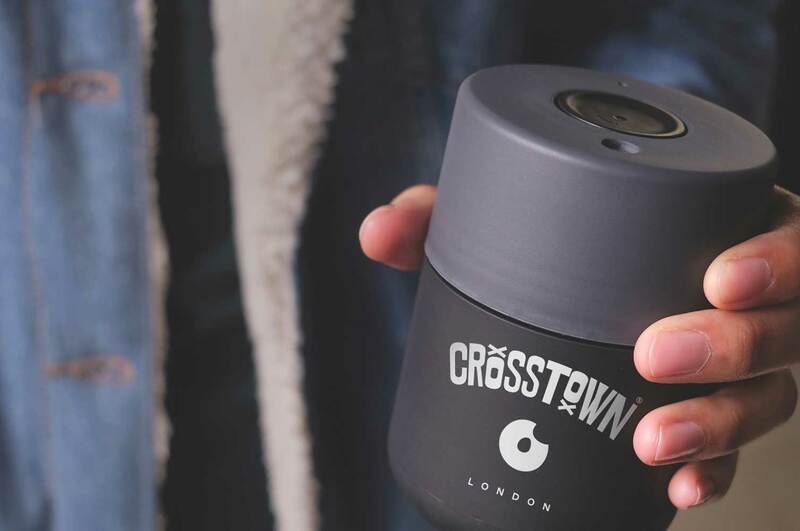 Searching for more sustainable ways of going about our day to day is a high priority at Crosstown. In addition to our fully recyclable doughnut packaging, we have invested in entirely bio-degradable coffee cups, lids, straws and spoons to make sure we’re acting with a practical conscience. You can also pick up a reusable coffee cup at all locations and bag yourself a free coffee, as well as a 30p discount each time you bring it, or any other reusable cup, in with you. Many Crosstown Doughnut and Coffee Bars have seating and offer complimentary wi-fi. 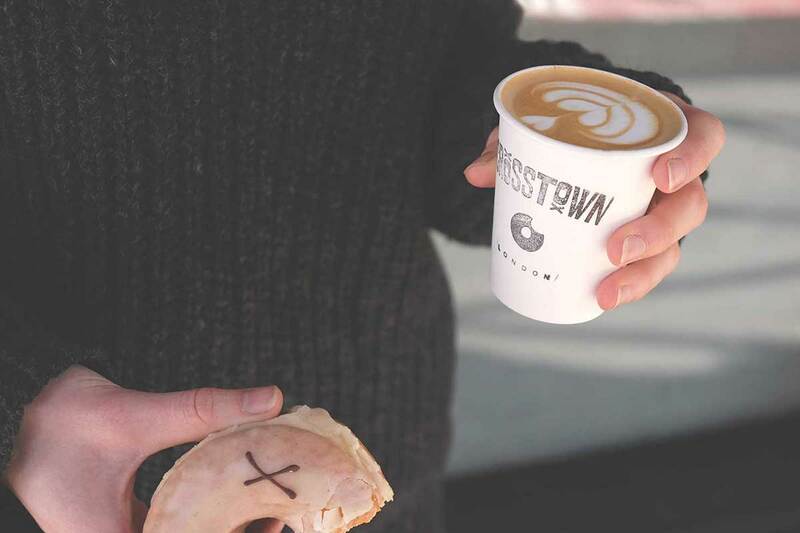 We have doughnut & coffee deals available at all Crosstown Doughnut & Coffee bars and also offer a per transaction loyalty card scheme. In the rush and haste of London, nothing satisfies quite like indulging in a fresh handmade doughnut, which is paired with a perfectly brewed cup of coffee. Great care goes into training our team or baristas, so not only are they a warm and welcoming face, they also know just how you like your cuppa. Most of our stores have ample seating and offer complimentary wi-fi.